Looking for a holiday home? Borgo Caiar satisfy your request. 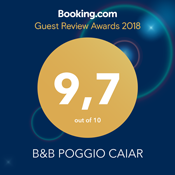 The Guest House of the B&B “Poggio Caiar” adjoins to the main building and is located in a traditional house in the countryside far away from traffic. The spacious and bright apartment with about 90 square meters, which has been restored and furnished with great attention to detail and in consideration of the traditional conditions, offers a cozy and friendly atmosphere to relax. The strategic location and good connections just 7 km away from the main towns of the lake and at the foothills of Mount Baldo make the B & B Poggio Caiar the ideal base for a holiday full of sport, with family and/ or friends. The apartment, which has a separate entrance, is located on the 1st Floor of the historic building. Bathed in natural sunlight through the many windows, the living room impresses with warm Mediterranean colors and features an LCD TV with satellite and CD-Player. The living room opens into a fully equipped kitchen. Upstairs you will find a bedroom with double bed, small sitting area and sofa bed, a bedroom with two single beds and a spacious bathroom with WC, shower, hairdryer and courtesy line. We would be happy to provide you with bed-linens and towels in our Guest House. The results of a very loving and detailed restoration as the antique wooden beams, warm Mediterranean colors on the walls and noble curtains, give the Guest House a very comfortable and pleasant atmosphere and invite you to relax. Special prices for stays longer than one week. - Bed-linens and towels € 10 per Person per week. - End cleaning € 50 per week. Advanced partial payment is required.